It appears Justin Bieber has a lot at stake in the men's ice hockey semifinals Friday. 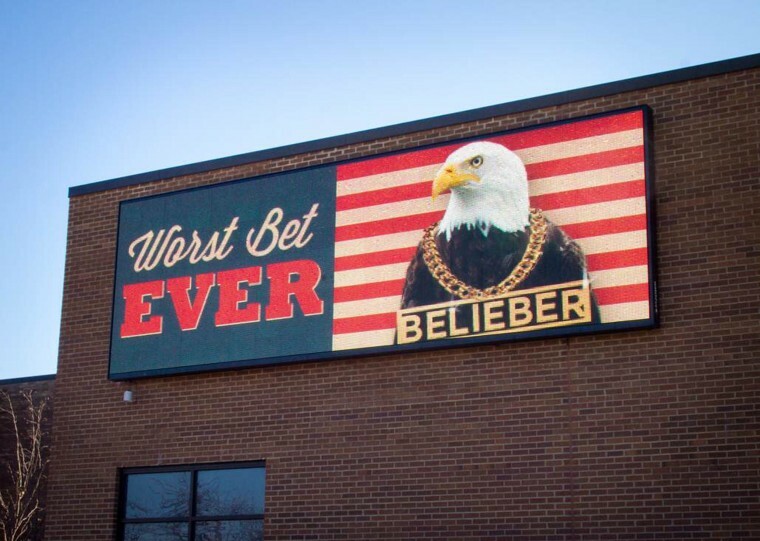 At least that's the joke in Skokie, Ill., a Chicago suburb where Bieber's image is plastered across a giant billboard, right between Blackhawk players Patrick Kane and Jonathan Toews. The two former roommates will square off on the ice, with Kane on Team USA and Toews playing for Canada. And as the sign says, "Loser keeps Bieber." Freight broker Command Transportation created the billboard, which adorns their headquarters. Visible from a major highway, it usually displays the company's name. But once a week or so the employees at Command Transportation like to have a little fun. "It's going to be tough to follow this one," said Dane Olsen, a software designer who helped come up with the idea. His photo of the billboard took off on Twitter and eventually became one of Reddit's top links. On Friday, four years after Sidney Crosby's overtime goal against the U.S. secured the gold medal for Canada in Vancouver, the two teams face each other once more in the semifinals in Sochi at 12 p.m. ET. The social media world is already buzzing, and everyone from Olsen to President Obama plans to watch. In addition to heads of state wagering beer and a fake Justin Bieber bet, an upstate New York bar is letting everyone know where its loyalties lie. The billboard will come down later today, according to Command Transportation. "We just like to give people a good laugh," Olsen said.